An unexpected new start in life morphs into a dangerous hunt for the truth. Callie Reed is visiting her Aunt Melodie, whom she has not seen in 10 years, on Maryland’s Eastern Shore. Melodie sells music boxes in charming Keepsake Cove, whose shops are devoted to all things collectible, and lives in one of the cottages behind the shops. Next door is her dear friend Delia Hamilton. A less hospitable neighbor, Karl Eggers, who’s outgrowing his model car shop, is eager to persuade Melodie to sell him her store. 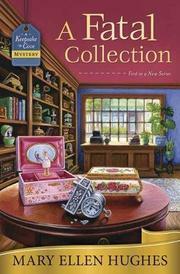 After a lovely evening of nostalgia and admiration for family items like her grandmother’s desk and her grandfather’s music box, Callie awakens to find Melodie dead in her shop, “eyes open and mouth slack, lying in a pool of dark red blood.” The police think her death is an accident, but Callie’s forebodings are intensified by spooky moments in which the music box suddenly plays by itself as if to warn her of danger. When she learns that she’s inherited all her aunt’s property, Callie ends her moribund romance and decides to stay and run the business with the help of Tabitha, Melodie’s part-time worker. She’s attracted to cafe owner Brian Greer, harassed by Eggers, and befriended by music box collector Jonathan Harman. She even gets drawn into a fight over ingratiating Duane Fletcher, who keeps the store owners association’s books. Some members have complete faith in Duane; others can’t help noticing that he seems to live beyond his means. The discovery of a box of love letters to her aunt fuels Callie’s need to know more about her death even though, in a town full of strangers, her hunt for information may prove perilous. Hughes (Scene of the Brine, 2016, etc.) kicks off her new Keepsake Cove series with a charming locale, standard-issue cozy characters, and a schmaltzy storyline.